In Part 1 I talked about the unboxing and a quick summary of the assembly of the saw. 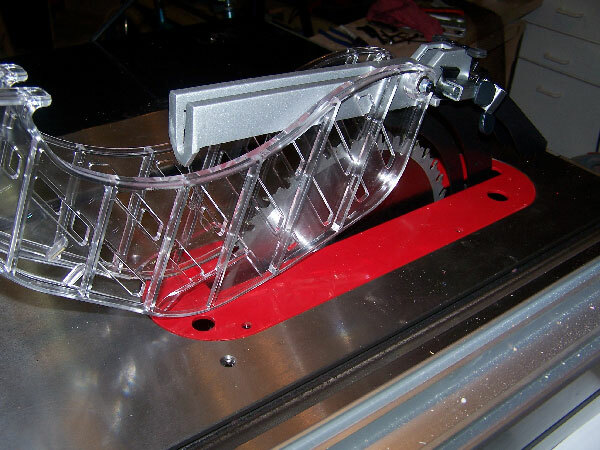 In Part 2 I talked about quality issues with the saw blade, and the minor tolerance challenges I had. 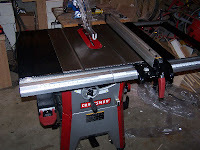 Here in Part 3 I will talk about dialing the saw in. The instructions that came with the saw (new ones with photos, not the old ones. If you get the old ones without photos, download the good ones from the Sears website) were quite good. If you follow them IN ORDER you will have a nicely dialed in saw. Let's start with the blade adjustment. The instructions give a great way to measure the blade front to back parallelism. One thing they don't tell you... Do NOT raise the blade 100%. Keep it a bit shy of fully extended. The design of the trunion mounting causes it to twist a bit when it hits the stops, and this will throw off your measurements. Clamp a dowel or stick to your miter gauge (doesn't matter if the miter gauge is adjusted for this). Set the dowel so it just touches a tooth at the front of the blade. Mark that tooth with a sharpie or something. Rotate that marked tooth to the back of the blade and slide the miter gauge with dowel so it's pointing to that same tooth. Is it just touching exactly like before? If not, you need to adjust the trunnions. Mine was 1/64th off, so I followed the instructions. 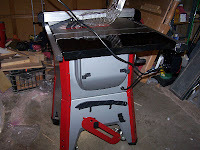 I removed the six screws on the panel at the rear of the saw and located the 4 bolts mounting the trunnion to the table. The manual said there are 4, but the picture only shows three. The fourth is way up front, hidden from view. Reach up there and feel around and you'll find it. I loosened all four bolts and tapped the trunnion with the heel of my hand until it was fully aligned. There's one angle where you pretty much have to hit the blade shield so be gentle. Once it's aligned perfectly (take your time, there's no rush here), tighten two bolts - One in the front, and one in the rear. Now measure again. This is making sure you didn't knock it out of alignment while tightening the bolts. If it's still perfect, tighten up the other two bolts. In my saw, the rear panel was one of the places with some tolerance and alignment issues. When you put it back on, only start the threads on the six screws. Then tighten the middle ones first, and diagonally tighten the rest. Middle, middle, top right, bottom left, top left, bottom right. And so on. This will keep the panel from warping or pulling the cabinet out of square. As with most inexpensive saws, the wings are stamped steel. The enamel coating on them is crap, just like most of the paint on this saw. So be gentle... I got a set of scratches on mine from laying it face down on the concrete floor. Whoops! I'm assuming you have a good straight edge around. I have two. A steel high quality 48" straightedge and an aluminum 48" level. Both are very straight. I use the straightedge simply as a reference to check the level, then the straightedge goes back on the shelf. The nice thing about using the level is it will stand there while you work. You don't have to hold it. Makes life much easier! I first mount the wings on both sides, getting the bolts only finger tight. Then I place the level on the table at the middle of the wing and tighten that bolt a little more, just enough for the lock washer to start to compress. Then I move to the front and do the same thing. By the time I get to the rear, it should already be on a plane with the table top. Crank all the bolts down and double-check that they stayed put. At this point, before doing ANYTHING else, clean the table and wings from your greasy fingerprints (you cleaned them before assembly as the instructions said, right?!?!?!) and apply a coat of quality wax. I avoid automotive waxes for tool use due to the additives they have, instead preferring a good quality furniture paste wax. I like Bowling Alley wax, which is available at Ace Hardware and elsewhere. But use what you prefer or have handy.The wax will help protect the paint and the table surface from light scratches, and make cleaning it up later much easier. Plus, if you're in a humid area, your table top started rusting the minute you cleaned the shipping grease off it! I like this fence. There are some complaints about it out there, but the design is wonderfully adjustable, and light and smooth. No, it's not a Bies, but it's much better than it should be for the price. Assuming you mounted the rails per the manual, this will be a breeze. Follow the instructions! Let me say that again: Follow the instructions! If you make the adjustments IN ORDER, the fence will work wonderfully. Keep in mind that all of these adjustments are methods of applying pressure to the plastic glides inside the fence. So don't overdo it. If any adjustment causes the fence to feel tight, or take effort to move, back it off and try again. Align it to the miter slots, NOT the blade. You've already aligned the blade to the slots, so use that slot as your reference point. Otherwise you could be compounding errors and end up with a kickback machine instead of a quality saw. The miter gauge that comes with this saw is a joke. Maybe I got spoiled with my Incra I used on my Rockwell Contractor's saw, but this thing... Ugh. The face isn't machined, it's enameled. The "stops" are just adjustable screws you bump against with a thin pin. And they were far out of adjustment out of the box. It was such a mess, I decided to align it to 90* and lock it down. No messing with the rest. That is enough to build a couple sleds, while waiting until I can get another Incra. Don't spend any time on this thing. Buy a quality miter gauge and put this one on a shelf somewhere. The riving knife and guard system. My favorite part of this saw is the riving knife design. The knife itself is fully adjustable from completely hidden to all the way over the blade. All with a lock knob and a release button. Super easy. For 90% of the cuts you'll make, the guard can stay in place, with the riving knife all the way over the top of the blade. It's a slick system. For the other 10% of your cuts, you lower the riving knife just below the height of the blade and you still get the kickback protection! I can't imagine a need to have it completely hidden, but if I think of one, I'll let you know. The adjustment is a matter of aligning the knife to the right side of the saw blade. That's it. And mine was perfect out of the box. Again, follow the instrucitons! That's it for dialing it in. 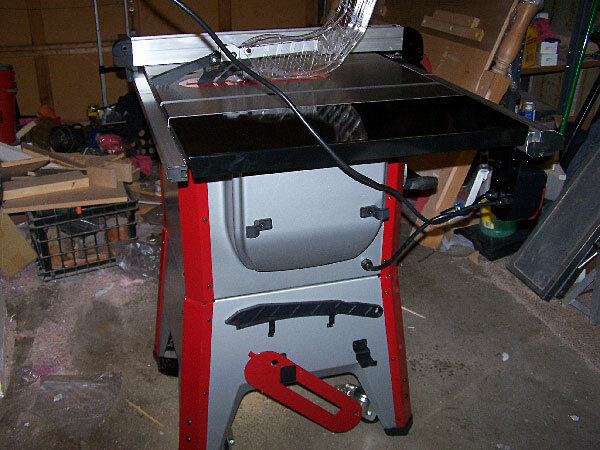 If everything is right, make sure the saw is flat on the floor (wheels retracted) and plug it in. 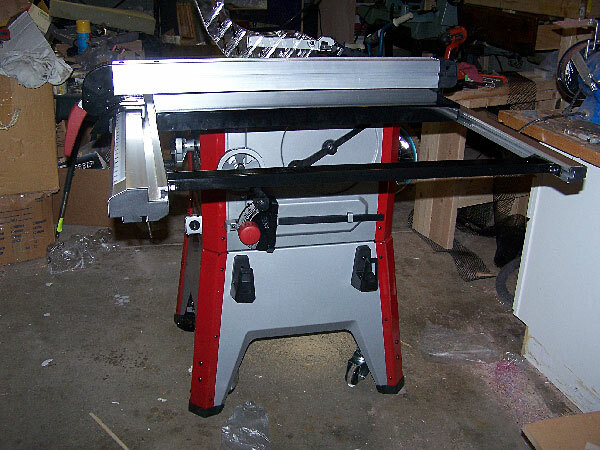 Make sure you're standing off to the left side of the saw (motor side) and turn it on. It should smoothly come to speed in moments. 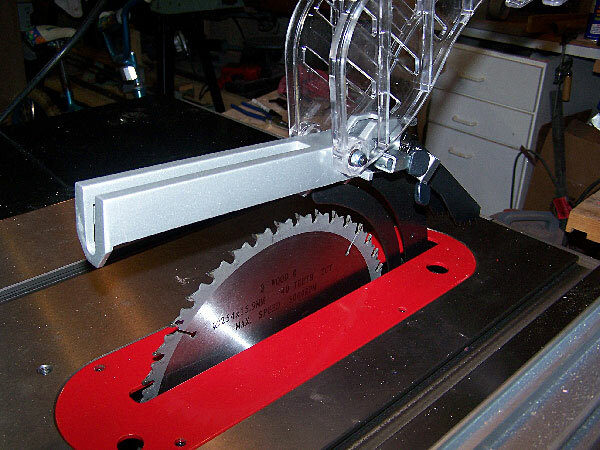 There should be no vibration on the saw, and if you either cleaned up the stock blade, or installed a good quality blade, there will be no vibration visible in the blade either. A popular test of saw performance is the "Nickel Test". Basically, you make sure the top is level to the world, and stand a nickel up on its edge. Then you turn on the saw. If the nickel stays standing, you have a finely tuned saw. After shimming the legs (my floor is nowhere near level) I did the nickel test on this saw. It passed. 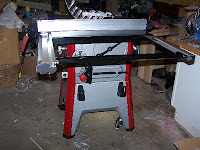 Next post will be a summary review of the saw after running some wood through it! Great article. I bought mine 'used' from sears (was a return) - You're detailed assembly instructions were most useful, especially for a noob like myself.